Ah, the Brantley Gilbert Big Machine Brickyard 400 — one of the most iconic races on the NASCAR schedule, on one of the most historic stages in all of motorsports. From yellow-shirts to yellow flags, this year’s trip to Indianapolis had it all. A lot of cars got torn up at the Brickyard this year. Seventeen did not finish with the official cause as “crash,” to be exact. Attrition in a race often means underdogs get a chance to shine. After all, racing on a shoestring budget means keeping the car clean is an essential skill. So, when, like in this year’s race at Indianapolis, the leaders wipe each other out, and a lot of faster cars crash, the finishing order looks different than usual. Matt DiBenedetto, driving the No. 32 for Go Fas Racing, finished eighth. Chris Buescher came home in ninth for just his fourth-career top 10. Timmy Hill, making his 200th NASCAR national series start, finished a career-best 14th in Carl Long’s Chevrolet. Thumbs up for the small teams and lesser-known drivers making the most of a tough race on a giant, historic stage. You know what’s good? Racing. Lots of racing. Like, specifically, when cars are moving at full speed past each other. For 400 miles at a time. The inverse of that — when cars are not moving — is not very fun. This year’s Brantley Gilbert Big Machine Brickyard 400 was halted three times: once for weather, and twice for crash cleanups. That means three race stoppages — three times where (most of) the cars stopped racing! I get it. Red flags are necessary for fan and competitor safety. But, by golly, I like to watch cars go. Thumbs down for when cars are not racing. You’ve got to hand it to Jimmie Johnson for giving it his best effort. While the No. 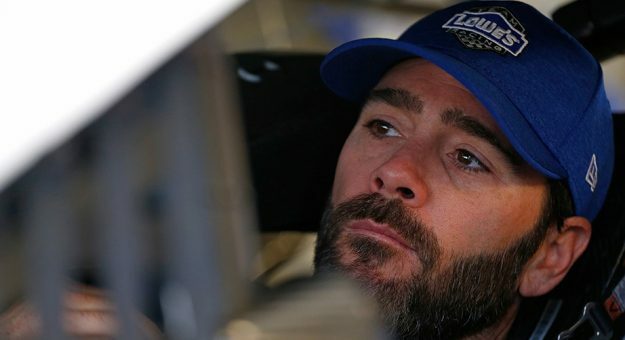 48 car experienced engine woes, sending smoke out of the back of his Chevrolet, it didn’t stop Johnson from attempting a daring three-wide pass for the lead. We’d be using the word “YOLO” if it were 2012. The scientific term in the racing community here is “goin’ for it,” and it’s worthy of a thumbs up, despite the maneuver ending Johnson’s day early. Truex took total responsibility for causing the accident that took out the two fastest cars (and, in doing so, also ended Busch’s hopes at at an Indy three-peat), but it still earns a thumbs down because it’s kind of a bummer to destroy — and thoroughly char, in Truex’s case — two dominant race cars. A bonus thumbs-down for the word “three-peat.” Yeah, it’s a clever word, but it’s a little too clever. Kasey Kahne’s summer of bad luck has seemingly reached an end after he claimed his first victory in more than 100 races. After five unlucky crashes in the prior eight races, and slumping to a disappointing 22nd in points standings, things hadn’t been looking great for Kahne. The past doesn’t mean much now, as Kahne now suddenly finds himself in playoff contention. The explanation for Kahne’s bad luck spell seems pretty obvious: clearly, he broke a mirror on July 23, 2010 — he’d only won six races in the following seven years. His seven years of bad luck ended Sunday when the overtime yellow flag ended the race just before sunset Sunday. A big thumbs up for the No. 5 car appearing in Victory Lane once again.